Not just a conference. 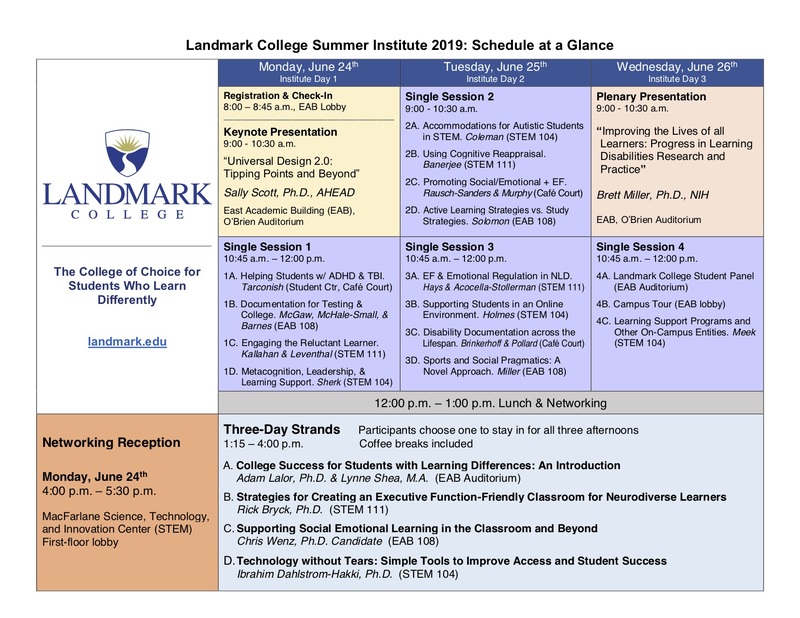 The Summer Institute at Landmark College has been an annual opportunity for education professionals to reboot their learning and refresh their enthusiasm for supporting students who learn differently. The Summer Institute combines hands-on, multi-day training workshops (or “strands”), world-class research presentations, a student panel, networking opportunities, and 30+ years of Landmark College expertise in teaching students with learning disabilities, ADHD, and Autism Spectrum Disorder (ASD). Monday, June 24, 2019, 9 – 10:30 a.m.
Universal Design has taken the field of postsecondary disability by storm. What was once a tentative idea for expanding access on college campuses has become a widely accepted paradigm for guiding our work. But in words familiar to every parent, are we there yet? Have we reached the goal of providing inclusive instructional environments that benefit a broad diversity of learners? Using Malcolm Gladwell’s notion of “tipping points,” we will examine Universal Design for Instruction/Learning in research and practice. What do we know so far? What thresholds have been achieved? And how can we use these tipping points to prompt next-generation thinking about Universal Design? This session will challenge you to think about Universal Design 2.0 and future directions for research and practice. 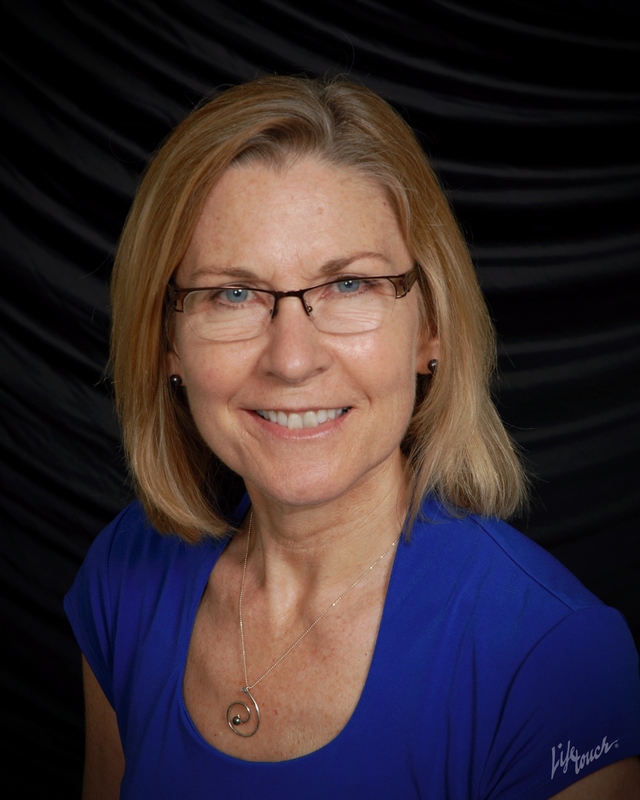 Wednesday, June 26, 2019, 9 – 10:30 a.m.
Dr. Miller oversees the NICHD funded research portfolio focused on learning disabilities. With classes ending for the school year, summer is a natural time to reflect on the past progress while recognizing and planning for current and future needs. This presentation will reflect on the progress made in our foundational understanding of learning disabilities impacting reading, writing and mathematics with an emphasis on its translation to intervention and more broadly practice. With an eye towards current efforts and future need, we will emphasize recent research focused on diverse population inclusive of individuals such as those coming from linguistically diverse environments and those with more complex learning challenges or with co-occurring conditions. Finally, looking beyond, we will emphasize some areas of future need with the hope of developing a dialogue to better understand the needs of the community including practitioners and individuals with learning disabilities. Three-day intensive, hands-on workshops (or “strands”) form a core component of our Institute experience. Participants stay in the same strand for all three days. Strands run 1:15 – 4 p.m. each afternoon of the institute, June 24 – 26. Single sessions are short (~1.25 hour) presentations on a range of topics with relevance for educators working with students with LD, ADHD, and ASD. Single sessions focus on practical take-aways and/or cutting-edge research in the field of learning differences. Participants choose one presentation per session to attend. Who should attend the Summer Institute? Or anyone wanting to learn more about supporting diverse student learners! Follow the links in the table below to register. Continental breakfast and lunch is included in the registration cost. +A group is three or more attendees. Don’t miss the opportunity to learn and network with small, focused groups of your peers! Get your voice heard and your questions answered. 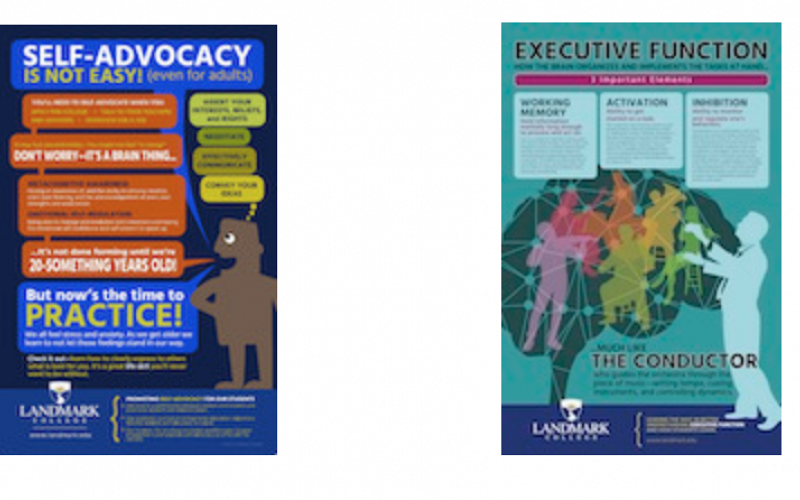 The Landmark College Summer Institute offers cutting-edge workshops with focused attention to participant questions, because we limit enrollment to keep our workshops small. Continental breakfast and lunch are included for all registered attendees, Monday, June 24 – Wednesday, June 26. 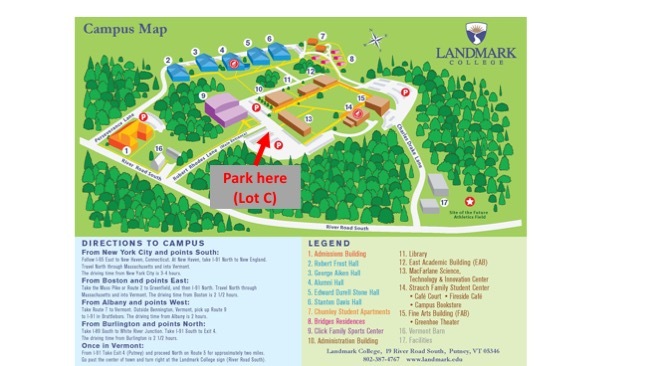 If you wish to bring guests (i.e., those not registered for the Institute) to the Landmark College Dining Hall, the lunch fee is $12. Dinner is not included. Dinner is available at the Dining Hall for $15 per person. Cash and credit cards accepted. There are also numerous excellent area restaurants. Participants attending all three days of the institute will receive a certificate of attendance, totalling 18 hours.